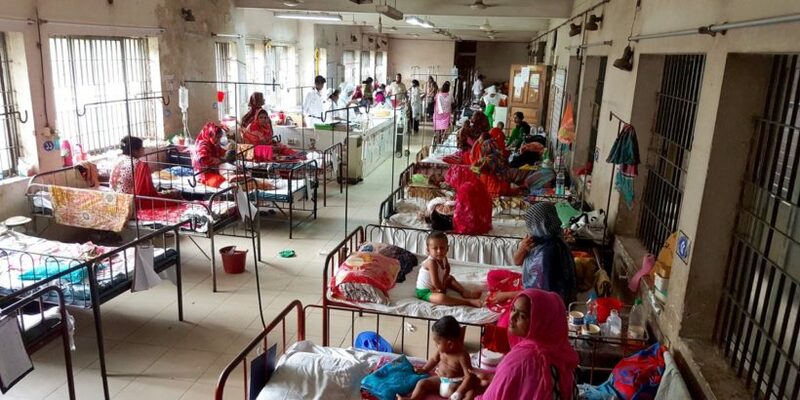 In Dhaka, the capital city of Bangladesh and one of the most densely populated cities of the world, stands the 4-storied, red-brick building of Dhaka Shishu Hospital – the largest children’s hospital of Bangladesh that admits about 23,000 children every year. The inpatient wards of the hospital are almost always at full capacity, filled with sounds of crying children, rolling steel-trolleys, beeping machines, and buzzing fans. Outside the wards are the outpatient departments, visited by about 350,000 children every year. Here, most patients are prescribed treatment and sent home with minimal records scribbled in busy notebooks. Unlike in the inpatient wards, the cacophony here does not allow one to differentiate between the sounds. Three-fourths of all bacterial pathogens detected in blood from children over 2 months old visiting this hospital consist of two pathogens – Salmonella Typhi and Paratyphi-A, the causative agents of typhoid and paratyphoid, collectively known as enteric fever. Globally, enteric fever causes more than 128,000 deaths and nearly 12 million illnesses every year, majority of which occur in low- and middle-income countries such as Bangladesh. In the pre-antibiotic era, enteric fever was a major killer; today, with appropriate antibiotics, recovery of enteric fever should be quick and without adverse events. However, the global rise in antibiotic resistance is threatening effective treatment. Ongoing extensively drug-resistant typhoid outbreak in Pakistan, infecting at least 850 people since 2016 with only one effective antibiotic option left, illustrates the magnitude of the situation and demands alternative interventions. In March 2018, the World Health Organization recommended typhoid conjugate vaccines (TCVs) in countries with a high typhoid burden; the first prequalified TCV was made available earlier this year. Countries face important decisions regarding vaccine introduction strategies that require local data. However, current burden estimates are primarily obtained from sporadic, historical studies, and do not reflect the most accurate situation in a community. Designing comprehensive surveillance systems in resource-poor countries with complex and dynamic care-seeking behavior can be difficult. In Bangladesh, for example, with no national healthcare system, patients decide where to seek care and pay out of their pockets. Besides patients hospitalized in inpatient wards, many people are treated in outpatient departments: given treatment and sent home. Most previous epidemiological studies of typhoid included only hospitalized cases in single healthcare settings. Recent reports show that most enteric fever patients are actually not hospitalized. Age of hospitalized and non-hospitalized patients differ and so do the antibiotic resistance patterns of their infections. To complicate matters further, a sizeable number of patients also seek care at the soaring number of private consultation centers, so data collected from hospitals and consultation centers tell separate sides of the story. Therefore, to generate credible burden estimates, it is important to account for these complexities in care-seeking behaviour. 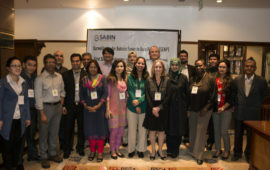 To fill knowledge gaps, facilitate informed policy-decisions, and eventually measure vaccine impact, the Sabin Vaccine Institute established the Surveillance for Enteric Fever in Asia Project (SEAP) in 2015. 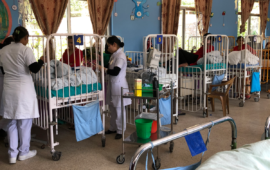 This multisite study in Bangladesh, Nepal, and Pakistan is the first of its kind and includes both inpatient and outpatient departments of hospitals, plus private consultation centers. It has also integrated community-based surveillance of healthcare facility utilization to generate incidence estimates. If successful, the model used by SEAP may provide a valuable lesson on how a well-designed study can go a long way to influence policy decisions and improve global health. Photo credit – Md. Shariful Islam, Child Health Research Foundation, Bangladesh.